INDIANAPOLIS — Gov. Eric Holcomb is concerned about teenage homegrown violent extremists in Indiana schools, according to a Nov. 17 Indiana Department of Homeland Security report. Call 6 Investigates obtained the document through two separate sources. 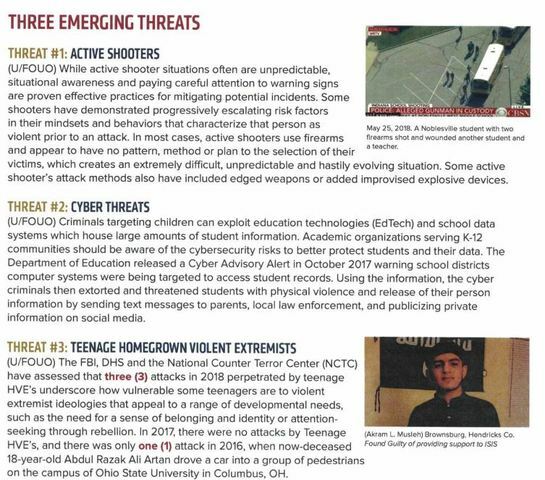 The nine-page document describes three threats to Indiana schools – active shooters, cyber threats, and teenage homegrown violent extremists. Homegrown violent extremists are defined by the FBI as "global-jihad-inspired individuals who are based in the U.S., have been radicalized primarily in the U.S., and are not directly collaborating with a foreign terrorist organization." </p><p>The first two threats are real concerns for police departments and schools across the state, according to multiple high-ranking law enforcement sources who are regularly briefed on local and national intelligence regarding threats. The actual threat of a teenage homegrown violent extremist attacking a school is low, the sources tell Call 6. They say listing it as one of the top three threats is not accurate. The sources spoke to Call 6 on the condition of anonymity because they are not authorized to speak to the media. "The Governor of Indiana, IDHS, the FBI and the NCTC remain concerned about the potential for teenage HVE’s to conduct attacks inside the state or violence targeting a school with little to no warning," the report states. "IDHS continues to urge vigilance and to report suspicious activities to law enforcement." As the report states, Indiana did see an 18-year-old Brownsburg, Indiana man get arrested while allegedly trying to join ISIS, there was never a threat to the high school he attended or any other schools in the country. The report was part of a briefing sent to emergency managers and police departments across the state. It quotes not only Holcomb, but other state agencies, such as the Fusion Intelligence Center, the U.S. Department of Homeland Security and the FBI. But some agencies never knew the report was being put together. The IDHS never consulted the agencies before sending out the report, even though they were quoted, Call 6 has learned. "This document was a compilation of unclassified information from law enforcement and public safety organizations regarding potential risks impacting school safety. This bulletin should not have been distributed before thorough vetting by all appropriate partners. IDHS holds immense respect for the law enforcement and first responder communities, and we are committed to following established protocols with all future communications." Call 6 Investigates contacted the governor's office to clarify the concern about the threat of "teenage homegrown violent extremists," the only response was to expect an email from IDHS. When asked again about questions specific to the governor, the office never responded to the email. In Indiana, IDHS oversees the response to disasters and investigating fires. The state’s Fusion Intelligence Center, which is operated by Indiana State Police, is often tasked with the responsibility to release reports like this one, according to law enforcement sources familiar with the process. The document is listed as "For Official Use Only," which is a classification used to keep documents sent to law enforcement and the intelligence community secure from the public. But it was also published on a website used by IDHS – where anyone on the internet could access it. The document could be seen by anybody with access to URL or via some creative searching. The author of the document warned against uploading it to an unsecured server, saying, "No Portion of this Bulletin should be released ... over non-secure internet servers." </p><p>Part of Langley’s statement also touches on the fact the document was so easily accessible. "I did not make clear the content was for informational purposes only, and the bulletin was distributed in a way that allowed recipients to forward the content to unintended parties," his statement reads.